Tanzanian rescue crews labored on Tuesday to recover victims of a train crash that killed at least 200 people and authorities promised an inquiry amid worries the death toll could mount further. Hundreds more were hurt when a runaway passenger train, hurtled backwards into a freight train on Monday. People trapped inside the mangled wreckage of the train cars cried for help as darkness fell, 10 hours after the morning crash, said Betty Mkwasa, a reporter with Independent Television. Rescuers did not have the heavy equipment needed to cut through the twisted steel to free those trapped, she said. "The way the coaches are piled on top of each other, from far away you would think it is a multi-story building," Prime Minister Fredrick Sumaye told parliament in Dodoma after visiting the scene. "The government will institute an inquiry to discover the cause of this tragic accident," said Sumaye in parliament. It was not clear when the inquiry would start. Survivors described how passengers had leaped from the speeding train in a desperate attempt to survive as the driver ran through packed carriages screaming that the train, with 1,000 people aboard, was out of control. Hospital officials said the death toll was at least 200, but was likely to rise as the grisly work of recovering the bodies from the mangled wreckage continued. "At least 200 people are dead but we fear there could be more," John Mtimbwa, the regional medical officer in Dodoma, told Reuters. A number of corpses were still trapped under the wreckage. One local journalist said he counted 100 bodies lying on the ground next to the mangled metal. Acting doctor in charge of Dodoma hospital, Jacob Chembela, said the situation in the hospital was desperate, with more than 200 patients, many of whom suffered from broken limbs and head and chest injuries. "We are receiving more people ... we are trying, we are doing our best but we are stretched with little equipment (to work with)," Chembela said. The passenger train was climbing a hill when it suffered a mechanical failure and rolled backwards towards an approaching freight train, said Isaac Mwakajila, assistant director-general of Tanzanian Railway Corporation. "The train went off the railway tracks backwards and smashed into another train behind it. It had 22 cabins, and 21 of them fell off the rail tracks," he said. The accident, at about 8:30 a.m. local time, is thought to be the worst of its kind in the vast east African country, one of the poorest in the world. "We are not sure of the exact number of those dead. It is very difficult to get figures from the scene," Mwakajila said. Survivors said the driver lost control as the train rolled back down the hill for about 30 minutes before slamming into the freight train. 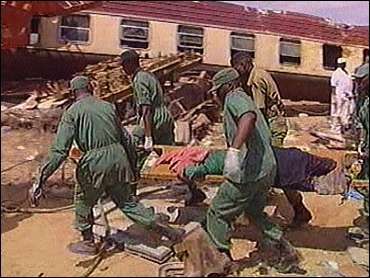 Survivor John Maganga, 32, said the train, going from Dar es Salaam to the northwestern town of Kigoma, was moving fast. "When the train rolled backwards, it gained momentum and was moving at a very high speed," he said, his head bleeding. Maganga and other survivors were taken to hospitals at Dodoma, about 60 miles from the accident scene. "It is a very bad situation, the hospitals are full to capacity and we have a shortage of doctors," said Anna Abdallah, the minister for health and a medical doctor, who was helping treat the injured in the wards at Dodoma regional hospital. "I think there may be more," she said when asked if there were more bodies yet to be recovered. The trains collided between Igandu and Msagali, southeast of Dodoma and about 250 miles west of Tanzania's main city and commercial capital Dar es Salaam. Tanzanian President Benjamin Mkapa visited Dodoma hospital to comfort the injured. Sumaye announced two days of official mourning.